If you look around these days, it would seem that small SUVs are becoming more and more popular by the year. Two of the more popular models have proven to be the 2018 Volkswagen Tiguan and the 2018 Kia Sportage. Both vehicles are fantastic representations of their class and will do more than just get you around the West Valley, Orem, or Murray City areas. At Volkswagen SouthTowne, we know that there is definitely a right vehicle out there for every person, and we want to help you find it. As a result, we’ve compiled this 2018 Volkswagen Tiguan vs. Kia Sportage comparison to help you narrow down which vehicle may be the right one for you. Once you’re ready to make a decision, come see us and we will do everything we can to help. How much can the VW Tiguan trailer? Find out by reading our 2018 Volkswagen Tiguan Towing Capacity Review. What is on the inside of your SUV is just as important as how the outside looks. For most drivers, the power component of their vehicle is one of the more imperative features. 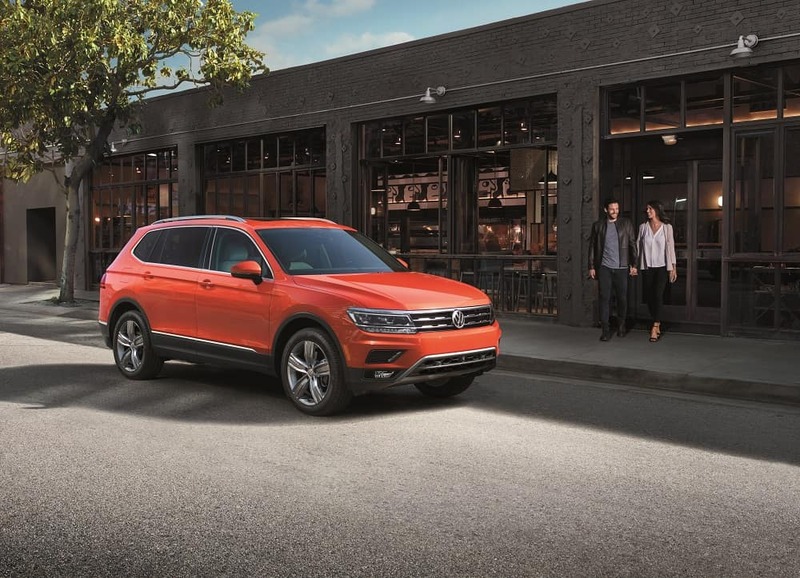 The 2018 VW Tiguan offers a lovely and compact standard 2.0L TSI engine that offers an EPA-estimated* combined gas mileage of 24 MPG. A similarly equipped Sportage, with the highest trim level, offers the same turbocharged engine, but the expected EPA-estimated combined gas mileage is 23 MPG. For drivers, this means less stops for fuel and longer shared moments in the car with your family. In both vehicles, there is more than enough pick up to get you into a waiting line of traffic on the highway, however the transmission differs a bit on each one. 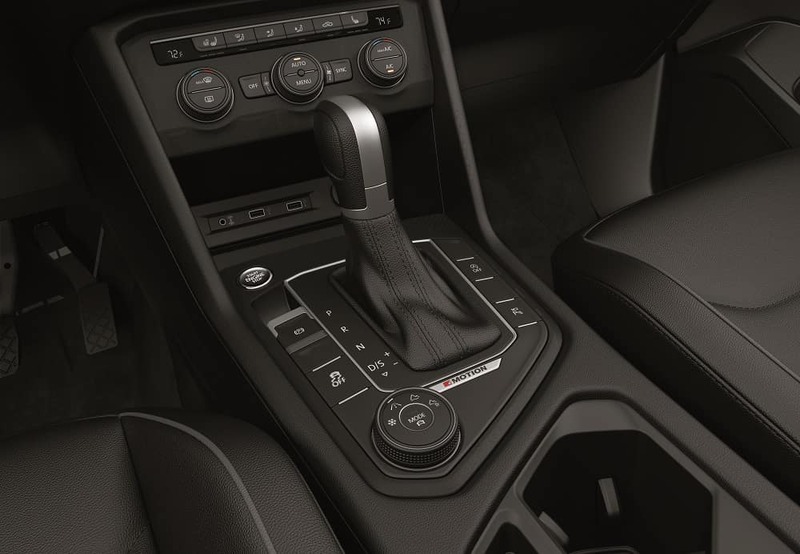 The VW Tiguan comes standard with an 8-speed automatic transmission with a manual mode, while the Sportage offers a six-speed automatic transmission with the same shifting mode. Essentially, the manual mode is added for drivers who miss the feeling of control that comes with your average stick shift car, but more “speeds” in your transmission means that the engine has more options as it reaches its potential. Unlike many vehicles in its class, the 2018 VW Tiguan actually offers third-row seating and has enough space to seat seven people. The 2018 Sportage has enough seating for five adults. If space is your reasoning for making the switch to a small SUV, you’ll need to weigh your options and see which vehicle works best for your needs, but it’s hard to go wrong with more seats. When your vehicle is just your own, you don’t spend as much time thinking about the amount of head- and legroom that is offered, but when you’re driving it as a family car, it’s something to think about. The VW Tiguan has 123.9 cu. ft. of passenger space, while the Sportage offers up 98.6, which is to be expected as the VW Tiguan is bigger. You’ll have 39.6 inches of headroom in the front seat of your VW Tiguan and 37.6 in your Sportage. More headroom means more space for taller passengers, a fact that your friend Tom, who is 6’3”, may appreciate. As we get more technological every day, we expect our cars to keep up, so the tech features are some of the first things we look for. Both vehicles come with the high-resolution center touchscreen infotainment system, both of which offer upgraded options. Each vehicle also comes readily equipped with a rearview camera, so drivers are better able to gauge the space around them to determine when backing up is safest. Each vehicle also offers some safety options that are desirable to today’s drivers. On the 2018 VW Tiguan, drivers will be treated to the innovative and standard Intelligent Crash Response System, which will shut down power to the fuel pump, unlock the doors, and deploy the airbags. On the 2018 Sportage, no such system is mentioned, but it does come packed with other safety features. When you’re ready to make your purchase, we are ready here at Volkswagen SouthTowne. We trust our drivers from West Valley, Murray City, and Orem to make the decision that is right for them, and our team of sales professionals are more than prepared to take you on the test drive that may help fuel your decision. Come see us today! *Your mileage will vary and depends on several factors, including your driving habits and vehicle condition.